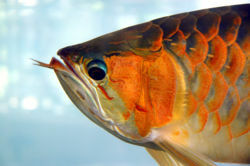 Please copy and paste ' [[Category:Arowanas]] ' into the end of your article to include it in this category. The Osteoglossidae (and Arapaimidae) or Bony-Tongued Fish family consists of two sub-families, Heterotidinae and Osteoglossinae; some four genera; and eight species. Bony-tongued Fish inhabit tropical areas of South America, Africa, Asia, and Australia. These prehistoric-looking fish are covered with a layer of large, thick scales. The head is protected with bony plates, and the eye are large. The mouth is hinge-like and faces toward the surface. The species of this family have been used to support the continental drift theory since members from different areas closely resemble one another. It is believed that members of thus family once existed in North America, Europe, and India, but died off for some reason. There has been little success with breeding Bony-tongues in captivity due to their shear size. Spawning has been observed in the wild. Some species are mouthbrooders while the rest construct nest from plants and debris. This page was last edited on 19 October 2015, at 14:25.